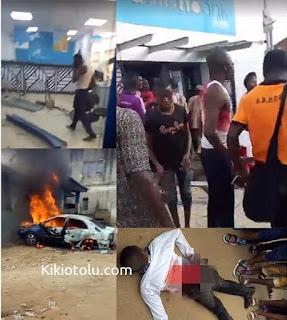 Suspected armed robbers on Tuesday attacked Union bank in Ilawe-Ekiti, Ekiti State, leaving two people dead in the process. In the operation that lasted over one hour, the robbers killed a policeman and a bank staff. Another bank worker was also reportedly shot in the arm. The Ilawe robbery attack happened barely a month after another old generation bank was attacked in Ifaki-Ekiti in which a police inspector was killed. The robbers stormed the bank which is located close to the Alawe’s Palace, at about 2.45 pm and operated unhindered for over an hour. They reportedly blasted the bank’s security door with dynamite before gaining entrance. It can be recalled that at least four police officers were reportedly gunned down during a robbery operation in Offa, Kwara State, last month. About six other residents and bank customers in the town were also killed in the operation which lasted for more than an hour. Sources in the town said the robbers blew up entrances into the banks with dynamite, before carting away money from about five banks.